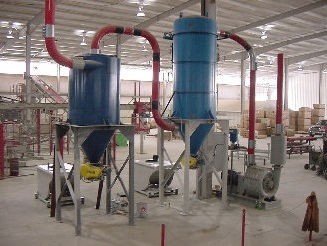 Stationary vacuum systems may serve a wide variety of applications, including spill cleanup (including explosive dust spills), material recovery, plant cleanup, batching, vacuum conveying, continuous discharging, pressure loading and unloading, pneumatic conveying and industrial vacuuming. The type of system a stationary vacuum manufacturer will build for you depends on your application specifications, most notably the materials you need it to gather. Some of the materials that stationary vacuum systems most commonly consume are dusts, such as sawdust, explosive dust and hazardous dust like asbestos dust. They also deal with materials like metal waste (ex. iron chips), blasting media, plastic resin, organic fibers, insulation, gravel and free flowing media like cement slurries. Manufacturers design stationary vacuum systems with a wide variety of features, per your requirements. Many, for example, come equipped with hoppers, which serve as the place gathered materials can be collected and then sent on for reuse or another application. To reuse or recycle said materials, these vacuum systems often also feature components like system separators and cleaning tools. Other vacuum systems feature load cells that weigh the materials they have collected. Still others feature belts for conveying materials through a central vacuum system. Some even come with a special high temperature resistant construction. In addition, many feature inlets where users may attach nozzles and hoses for focuses cleaning.